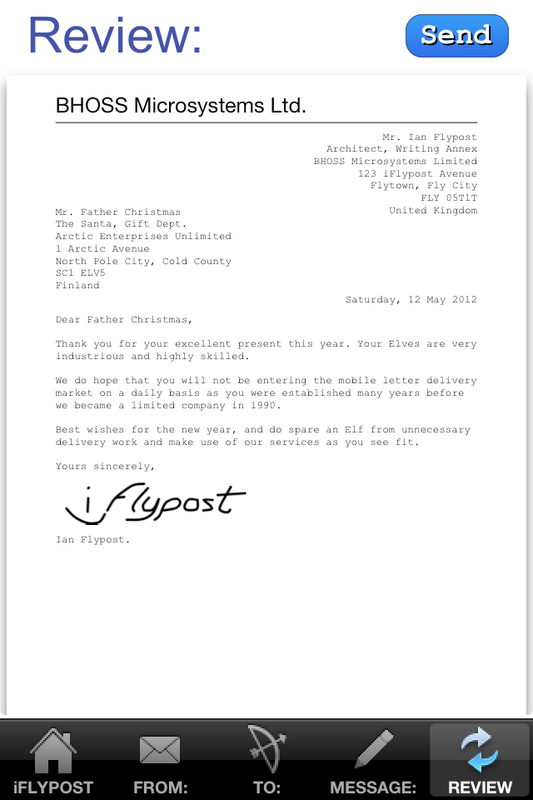 The iFlyPost Apple iPhone and iPad App lets you send real letters and telegrams quickly from your i-Device. It is integrated with the device's Contacts, Calendar and Photo fuctionalities. iFlyPost is seamlessly integrated with Apple's Contacts, Events and Pictures within your iDevice. It's easy to send a correctly formatted letter just load your details from your existing contacts or make a new contact directly from within iFlyPost. You can sign the letter, place a Business Header at the top and set reminders. You can send your letter immediately (we accept letters until past 6pm UK time) or delay sending until a specified future date.Express in-app payment is built-in so it is very quick and easy to pay by credit, debit card or PayPal. Prices: a 1st Class UK letter can be sent for as little as £1.50p. 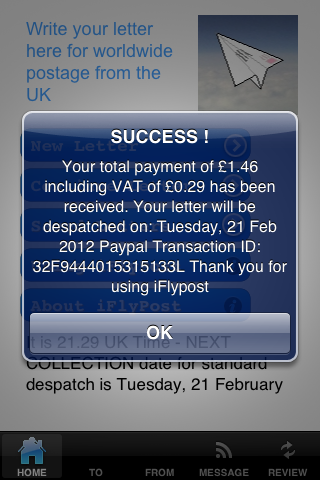 The iFlyPost App costs a one-off 69p (or equivalent and is available from AppStores in most countries worldwide. Here is or quick step-step Guide: . Many questions are answered in our FAQs: section. We hope you enjoy using iFlyPost. Support is available to our registered users and we are always interested in your feedback. 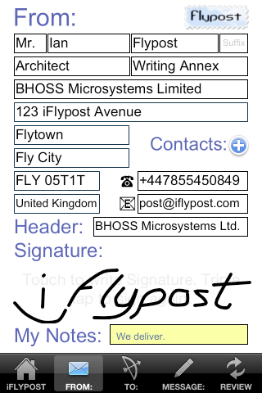 iFlyPost is produced by the long established UK company BHOSS Microsystems Limited. BHOSS provides flexible IT development and services from simple websites through native mobile e-commerce systems to customised digital electronic solutions. We are particular interested in exciting collaborative ventures. We can provide business IT consultancy and training on a daily or long term basis. If you are interested in talking to us please drop us a line at: enquiries@bhoss.co.uk. 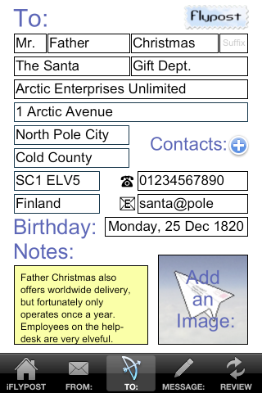 Organise and Send real letters and telegrams Worldwide from your iPhone, iPad and iPod Touch. iFlypost is a fully integrated App and service that manages your contacts and birthday events & allows you to send and pay for a real standard format letter directly from your i-device. It is integrated with Apple's standard Contacts, Events, Reminders, Photo, Notes and Email systems so it is a breeze to use with your existing info and data. Not only can you send a printed letter from anywhere to anywhere in the world but you can despatch a same day telegram to an increasing number of UK locations. 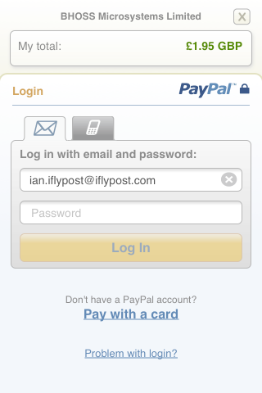 The iFlypost flow is intuitive and flexible, you can start with the address details of the person you are sending the letter to, add your own details, type in or paste the message, review the whole letter and then pay for it with your PayPal account, a phone based PIN or by using most credit & debit cards. iFlyPost is produced and copyright to B.H.O.S.S Microsystems Limited (BHOSS). BHOSS is a UK Company incorporated in 1990 and involved with new hi-tech developments from bespoke hardware through to construction VR and augmented reality. We are based in the sunny South of England near Gatwick Airport. The iFlypost flow is flexible - you can start anywhere, filling in information as it becomes available to you. However this guide takes you through one particular path for writing a letter FROM: your address details TO: the address details of the person you wish to send your MESSAGE: and then on through to final DESPATCH: and PAYMENT:. iFlypost is a Tab Bar based app. so you will always know where you are are by looking at the five icons at the bottom of your screen. Don't worry, your draft letter is kept in memory so you can move between iFlyPost and other Apps without losing your work in progress. In the HOME: view you can choose a New Letter or continue with the last letter you were working (iFlypost keeps you most recent work in memory if you are interupted. Once you have sent and paid for a Letter it will appear in the Saved Letters area from where you can also email the letter. There are also buttons to iFlypost's Using iFlypost guide and information About iFlypost and BHOSS. At the bottom part of the screen iFlypost displays the currrent UK time and keeps you up to date in real-time with the next available Standard Collectiondate & time. Add your own details such as your name, address and company or load this information from your device's standard Apple Contacts via the Contact: button. Here you can create a Signature directly on your iPhone. Later you can position this anywhere in your letter in the MESSAGE: View. You can add a Business Name Header which will display at the top of the first page of your finished letter. You can access and amend the standard Address Book Notes. Add details such as the name, address and company of the person you wish to send your letter to or load this information from your iPhone's standard Contacts. You can view and change the Photo and Notes assocated with your contact. A tap on the email icon will kick-off an email and a tap on the phone icon will place a phone call You can set your contact's Birthday here and set two reminders of this event. Type or paste in your message here. You can touch the Enter key to enter paragraph breaks but otherwise just enter your words separated by spaces as necessary. Please note that full line and page formatting does not occur until the REVIEW View which will show you exactly how the printed letter will appear.Tweak the letter's appearance by moving back and forward between these two views. You can cut and paste from other sources as required. It is here that you can INSERT the signature at a single position in the letter. Note that you can compose a signature in the FROM: View. For security reason some characters are not allowed and will be filtered out by the App. at this stage. Here you can see what your letter will look like when it is printed out. If youare satisfied with the letter and wish to have it despatched or delivered touch the Send button - if not use the Tab Bar to navigate to the appropriate section of your letter. iFlypost automatically works out the current cost of posting or delivering your letter based on sender's residence, the destination and number of pages and presents you with the options available to you in terms of despatch, delay or delivery. Please note that the Royal Mail does not collect on Sundays or Bank Holidays - iFlypost automatically takes this into account. Please note that iFlypost Express "Telegraphic" Delivery is only available to certain UK addresses as displayed to you at this point based on the information you have supplied concerning the delivery address and time of day. Here you can decide to send the letter to catch the next collection date and time or delay sending the letter for up to a year or so. We usually accept a letter for posatge up until 18.00 Mondays to Fridays and up to Noon on Saturdays. In some parts of the UK a same day Telegram service is available during the day. If this service is available you will be presented with the option and details in the EXPRESS DELIVERY section. Mobile Express Checkout is the in-app purchasing system built into iFlypost, making it easy to pay for your letter. Please note that you do NOT have to have a Paypal account to pay for a letter. BHOSS/iFlypost does not pass on any of your confidential information during this process - this is between you and Paypal. iFlypost acknowledges your payment and succesful receipt of your letter to BHOSS. If you have supplied a valide email addres, you should also receive an email from Paypal confirming payment to BHOSS. 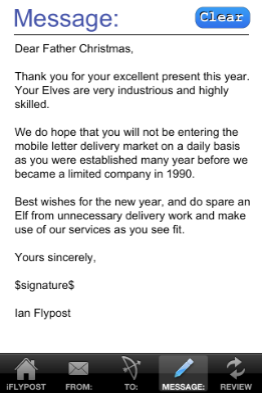 iFlypost only stores this letter on your iPhone but it is available to you from the iFlypost HOME View's Saved Letters View. If you wish to send an email of the letter in PDF format you can do so from the Saved Letter View. 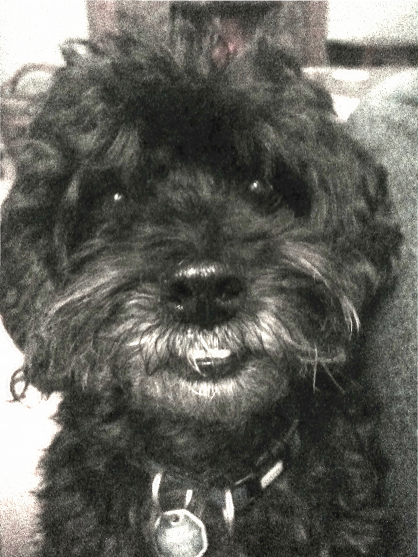 Gustav and all of us at BHOSS/iFlypost thank you for using this service. If you have a technical or payment problem please email us at service@bhoss.co.uk. You can send us feedback or suggestions to feedback@bhoss.co.uk. You can also send us a note during the Paypal Checkout experience itself. We hope to develop further services in the future. Please stay tuned and upload any updates to this release through the AppStore. Please review the list of questions and answers below. If you have an additional question, please email us here: FAQ Request. 1. Can I sign a letter in iFlypost? Yes, in the FROM: View there is a Signature box at the bottom of the screen. Simply write your signature in this box using your finger. If you wish to delete the signature tap three times on the screen. 2. I want to position my signature anywhere in my letter. Can this be done? Yes, firstly see FAQ no. 1 to create your signature. Then go to the MESSAGE: View. Touch the message at the point you wish your signature to appear in the finished letter. The (sign) button should appear at the top of the screen. Touch the (sign) button and your Signature will be placed in your document at the point where the cursor is. Note only one signature in one place is allowed or is possible. You do not need to delete the old signature's as this is done automatically, The signature appears in the MESSAGE: View as the string: $signature$. 3. Can I put a business name or a general banner at the top of the letter? Yes, in the FROM: View there is a Header box in the middle of the screen. Just type in your header here and it will appear in large letters at the top of the first page of your letter. If you do not want a header just ensure that the header box is empty. 4. Can I delay posting a letter for a Birthday or to cancel a contract for example? Yes, in the REVIEW/Post or Courier: View there is a (Post Later) button. Here you can delay the posting of your letter for about two years. You must pay for your letter at the time you do this. Remember that iFlyPost will POST on the day you specify - you will need to specify that an earlier date is specified! 5. When is the Last Collection of the Day? As long as you start paying for your letter by 6pm UK Time on a Monday - Friday it will catch the last Royal Mail collection of the day. The deadline for Saturdays is Noon. Royal Mail does not collect on Sundays or Bank Holidays. The iFlyPost App is aware of these dates and will only offer possible dates (see the minute by minute update at the bottom of the HOME: Page to see the Next Collection date). Yes, in the FROM: & the TO: View touch the (Contacts) button and you can choose from any of your contacts. 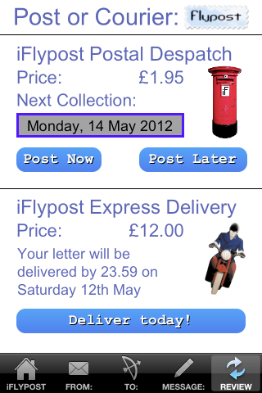 When you choose, iFlypost updates with all name address, notes, phone, email, birthday and photo information. iFlypost will also check any entries that you are making saving changes to the appropriate contact. 7. Can I set birthdays in iFlypost? Yes, in the TO: View just touch the Birthday text box and you will see a date spinner.While you are there, you can set a reminder - see FAQ 9. 8. Can I set reminders in iFlypost? Yes, in the TO: View if you touch the Birthday Text you will be taken to the TO:/Reminder View where you can set two reminders. These are saved as a standard Event. 9. Can I dial a telephone number direct from iFlyPost? Yes, in the FROM: or the TO: View touch the Phone icon or double-click on the phone Text. 10. Can I send an email directly from iFlyPost? Yes, in the TO:, FROM: View if you touch the Email icon or double-click on their Text. Also in the HOME:/Sent Letters View you can email your letter in PDF format after you have paid for the letter. 11. Can I take a photo or choose an image from the camera roll from within iFlyPost? Yes, you can pick a picture or use the camera directly from within iFlyPost in the TO: View. This image than gets saved in you standard Apple Address Book. 12. Can I put a photo or graphic in my Letter? Sorry, not in version 1.0 but look out for updates as this is planned. 13. When am I committed to sending a letter? You can abandon a payment and go back to alter your letter at any time up until the point you touch the PayPal PAY button in the Express Checkout Screen. Except when you are in the process of paying for a letter or reviewing the the EULA you can go backwards and forwards via the Tab Bars at the bottom of the screen. 14. Will iFlyPost retain the letter's contents if I have to close iFlyPost, or switch to another App or make a phone call? Yes, iFlyPost is persistent so even if you close the App or the system closes it for you, your data should automatically re-appear at the point where you left it. 15. I want to change the Country I am sending To or From. How do I do this ? go to the TO: or FROM: View, touch the Country Text and a "spinner" will appear - choose your country here. 16. I want to change the Country I am sending To or From. How do I do this ? 17. Can I change the font or text colour of the printed letter? 18. I want to EXPRESS DELIVER (telegraph) a letter but the option appears not to be available ? 19. How many pages can an iFlyPost Letter contain? We have tested a letter of 100 pages. Actual maximum will depend on your device's specification and available memory. 20. When am I committed to sending a letter? You can abandon a payment and go back to alter your letter at any time up until the point you touch the PayPal PAY button in the Express Checkout Screen. Except when you are in the process of paying for a letter or reviewing the the EULA can go backwards and forwards via the Tab Bars at the bottom of the screen. iFlyPost calculates the cost of a letter automatically during the Review process. Prices are also published under the main navigator at the top of the website. 22. How are VAT and Disbursements charged? VAT is charged at current UK Rate if you are sending a letter FROM: the European Union (EU). Cost price disbursements for Royal Mail stamps and some banking charges are explicitly treated as disbursements and do not attract VAT. This is calculated for you and appears before you decide to PAY. 23. What paper & envelopes does iFlyPost use? iFlyPost uses standard quality white paper (80g/sqm) for First Class UK & European Airmail. 65g/sqm paper may be used for International Airmail Letters in order to keep within the strict Post Office weight bands. iFlyPost will print on both sides of the paper so the minimum letter can occupy two sides. Envelopes are usually windowed - windowed Airmail envelopes are used for International Airmail. 24. Is Laser Printing always used? Laser double-sided black mono-spaced type face output is the standard. In extreme circumstances we may use high quality single-sided laser or ink-jet printing. If this results in additional postage costs this will be covered by BHOSS at source at no additional cost to the customer. We will always maintain the same page layout as displayed in the final review screens. iFlyPost is owned 100% by BHOSS Microsystems Limited (BHOSS) as at June 2012. 26. Which Payment Methods does iFlyPost accept? iFlyPost presently uses PayPal's Mobile Express Checkout system which allows for very speedy in-app payment using many standard Credit and Debit Cards as well as through a standard PayPal account or PayPal Phone account. 27. Is iFlyPost available in all Apple AppStores internationally? PayPal Mobile Express Checkout is not available from certain countries such as Andorra and India, consequently iFlyPost is not purchasable from these places. 28. Do I have to be connected to the Internet to use iFlyPost? You can prepare a letter and review its final appearance without being connected. However once you touch the (Send) button in REVIEW: View a call is made across the Internet. If no connection is available you are advised and can continue sending the latter when you are in range of a WiFi or phone connection. 29. What is a Note in iFlyPost? Notes are stored in your standard Apple Address Book, however iFlyPost brigs them to the fore, making it easy to see the notes about a particular person. 30. Does iFlyPost keep my Payment Details? BHOSS/iFlyPost delegates all of these details to PayPal. We are aware of who pays us but BHOSS does not keep any of your detailed card information or related details. 31. Where does iFlyPost store data? 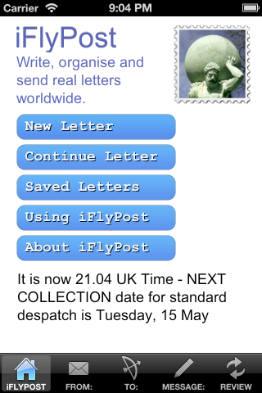 iFlyPost is persistent, in that your current letter in progress is kept in RAM on your iDevice. Once you have sent and paid for a letter a copy is retained permanently on your iDevice at HOME:/Saved Letters View area. Other than this all your data is shared with and stored back into the Apple Standard Apps such as the Address Book, Events and Photo Album. 32. What happens after iFlyPost posts a letter? You, the customer takes responsibility for ensuring that the TO: and FROM: addresses are accurate. iFlyPost does not check these details. Once iFlyPost deposits a letter with Royal Mail (or other delivery partner) for onward delivery or posts the letter directly at the destination, no further responsibility is taken for the letter or other such product. * The Questions and Answer format (Frequently Asked Questions) has a long history, pre-dating the Penny Post. See Matthew Hopkin's book "The Discovery of Witches" , 1647 in which "Certaine Queries answered". 1. 2. FROM: Outside European Union Countries. 2. 2. FROM: Outside European Union Countries.